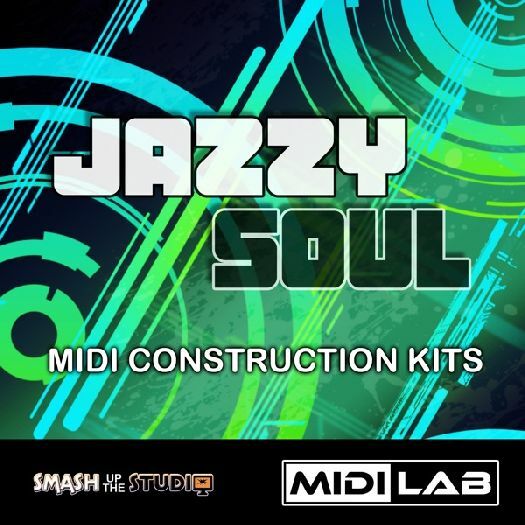 Smash Up The Studio presents "MIDI Lab: Jazzy Soul" This is the first of their new MIDI Lab series, a range that will contain only the best quality MIDI loops with an emphasis on high musical performance! "Jazzy Soul" contains 3 stunning MIDI Construction Kits containing all the loops featured in our demo's. Each kit has been broken out into separate loops so the user can arrange the parts to their own requirements. Keyboard parts include gorgeous funky Clavinet grooves and jazzy electric piano hooks as well as stunning MIDI loops for electric bass guitar, played in the style of both fretless bass and standard. There are MIDI arrangements for Horns and Strings and a couple of great solos for Vibraphone and lead Synthesiser. The String arrangements are programmed for either a ready made string ensemble sound, or also as separate parts for Violins, Violas and Cellos so you can really build up the sound like a real orchestra. The Construction Kits were recorded with "live keyboard takes" two of them recorded with a live drummer for maximum real feel! So you are not getting just one 4 bar loop pasted down the track, you actually have one continuous keyboard performance which was then chopped up into loops, all of them different. This is the same for the bass parts also and each kit has many variations. The demo's recorded with live drums also have endings in real time, which is also reflected in the MIDI, so you can have a proper ending to your mix. Tempo info is included as are Key Signatures and chord progression info. We have included an MP3 mix with each kit for user reference, these mixes are not covered by the license and are owned exclusively by Smash Up The Studio. All MIDI content in the pack is royalty free and can be used for commercial purposes under the terms of our license agreement. 3 MIDI Construction Kits. 118 loops in total. Please Note: Smash Up The Studio's MIDI products contain only MIDI keyboard and instrument loops. They do not contain audio or drum loops.